Mobile apps are transforming virtually every industry, and healthcare is no exception. Few years back, hospitals were considered an uncomfortable and intimidating place for patients. Gloomy and monotonous waiting rooms, long queues, dispirited faces of casualties, and the irresistible desperation to get inside the doctor’s cubicle – this is the picture one would imagine maybe a decade ago while visiting a hospital. Well, this dilemma no longer exists in today’s modern world, thanks to the booming healthcare app market. Nowadays, healthcare professionals are more focused on providing innovative digital solutions that not only transform patient experience but also improve patients’ medication adherence and overall wellbeing. 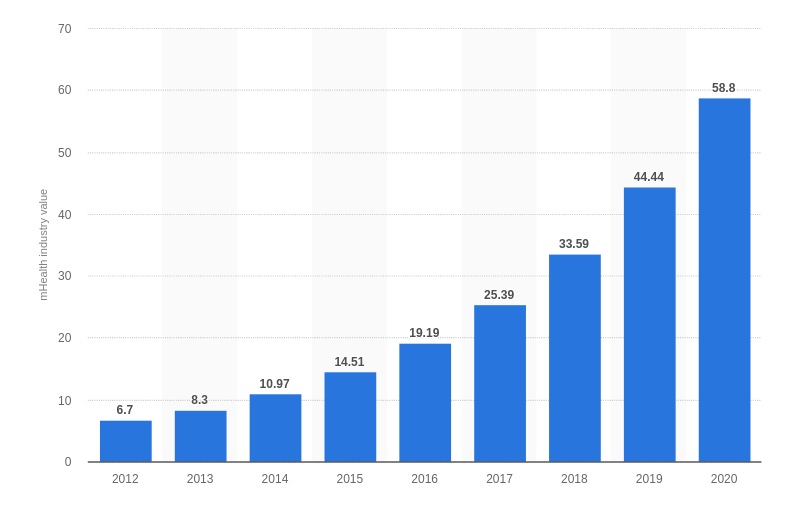 The mobile healthcare (mHealth) industry has been moving at a breakneck pace over the past few years, and there’s no sign of that impetus slowing down any time soon. According to Statista, an online market research and business intelligence portal, healthcare apps will become one of the top revenue contributors globally in the coming years. It is foreseen that the mHealth market will grow from $25.39 billion in 2017 to $58.8 billion in 2020. Added to that, about 40 percent of doctors around the world believe that the mHealth technology will drastically reduce the patient’s visit to their clinic and will empower them to better monitor & manage their own health, encouraging them to live healthier lifestyles and avert various health problems before they arise. Here’s how mHealth apps are rapidly conquering the patient-driven market and proving to be a lifesaver for both patients and healthcare providers. In today’s technology-driven mobile world, both healthcare providers and patients use smartphones. This naturally proliferates the demand for the development of health apps, which improve physician efficiency and patient care significantly. In addition to that, mHealth apps also reduce patient wait time and allow physicians to access all their documents and reports from virtually any device with minimal fuss. These apps help healthcare professionals to have better coordinated as well as timely access to patient information, enabling patients to create an incomparable healthcare experience. The evolution of mHealth apps has made the appointment booking process a breeze for patients. Long gone are the days when people had to book a doctor’s appointment either by calling his assistant or by rushing towards the clinic or hospital to have their names written in the appointment register. Today, online scheduling has taken over and has become patients’ most preferred way for scheduling appointments. Using mHealth apps, people can schedule appointments effortlessly from anywhere with just the tip of their finger. Also, they can view the schedules of their preferred doctors and book appointments at a suitable timeslot, without standing in long queues. Mobile healthcare apps are developed with the potential to benefit both patients and physicians. While doctors can foster relationships with patients by preventing them from waiting in long queues for medical care, patients can find an appropriate specialist with hands-on experience, schedule a quick appointment with the doctor of their choice, and view their medical test reports online without having to visit the lab. Besides that, mHealth apps come with a standout feature of live chatting, which allows patients to have one on one interaction with their doctors and discuss their health issues after paying a reasonable fee online without paying a visit to the clinic or hospital. All these factors tend to enhance patient engagement, security, and satisfaction. According to research, 70 percent of medical practitioners manage patient data through mobile apps. Medical apps such as Kapture and Practo allow users to upload and store their Electronic Medical Records (EMR) in the app, which may include X-ray or ECG reports, prescriptions of the doctor, diet and nutrition charts, and other important information. These apps are usually cloud-based, which ensures that the information is secured, seamlessly integrated across multiple devices. If a patient visiting one specific doctor relocates or moves to a new city, he need not have to worry about starting from scratch with a new physician. If the patient’s medical records are updated on the app, the new practitioner can start from where the previous physician left off. Besides the ones mentioned above, there are countless other benefits of mHealth mobile apps, some of which include reduced medical bills & expenses, more accurate diagnosis, immediate access to care, instant connection between doctors & patients, and enhanced healthcare & disease control. Long story short, mobile health apps are a crucial part of the healthcare industry, and their role is expected to grow steadily over the next few years. If you’re looking for someone who could build a robust, feature-rich mHealth app for your business, then contact us. We’re a leading mobile app development company that leverages IoT, Blockchain, AI, and other cutting-edge technologies to develop high-end mobile applications for SMEs, startups, and global enterprises. You can drop us a line at info@debutinfotech.com or call us at 1-703-537-5009. At Debut, Tajinder has led projects in the areas of Mobile computing, Cloud computing, Web Application Servers, Java, TCP/IP, real-time collaboration software, and high-performance transactional systems.